Parks, trails, and recreational facilities provide a wide variety of opportunities for physical activity and can help many Americans lead a more active lifestyle. This infographic highlights evidence that parks and recreation areas can increase physical activity levels while also providing economic benefits to families and communities. 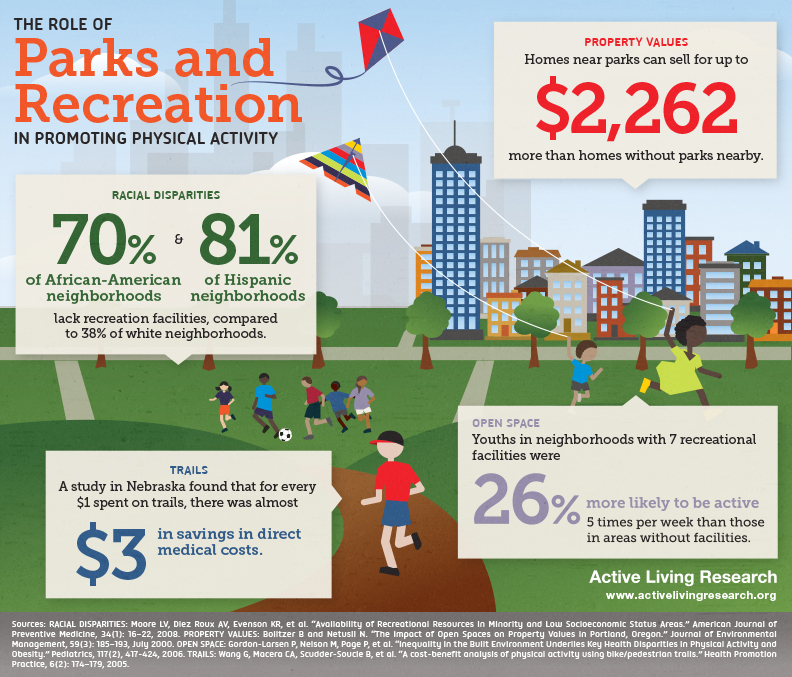 The infographic also shows that racial disparities exist in access to parks and recreational facilities. This infographic can be downloaded for free in JPG format (442 KB) by clicking on the image or the "Download Original" link. A high resolution PDF version (1.1 MB) of this infographic is also available upon request. When requesting, please let us know how you intend to use the infographic. These infographics are wonderful and should be in every park and recreation center around the country. We are glad that you find the infographics useful. It is something that we plan to continue to do more of to help present data in a more visually appealing format that everyone can understand. Please do post this in your parks and recreation centers and share with your colleagues! Let us know if there is anything else that we help with as well.